Plato wrote that God created the universe using geometric shapes and numbers. These shapes, shown below in drawings and solid models, represent the five basic periodic elements: earth, air, fire and water. These shapes are known as the Platonic Solids in Sacred Geometry. 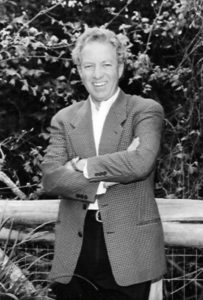 Plato further wrote, when completed, God realized he was missing the fifth element, a binder, something to hold the other elements of the universe together. God created Aether, spirit, Ka, Chi to bind all earth elements together. The binder is called phi, ø, and is generated by planetary movement with each other as described below as in the orbit of Venus around earth. 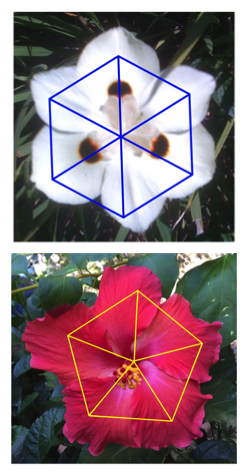 The Platonic Solids are all drawn within and live within the Flower of Life, shown at left. All Platonic Solids and the Flower of Life exist in real time in three dimensions. 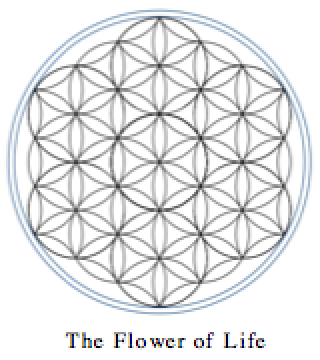 The Flower of Life is an ancient symbol found in many archeological explorations, around the world. One such finding was in the Osirion Temple in Abydos, Egypt. 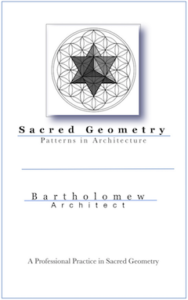 In the book, Sacred Geometry: Patterns in Architecture, the Flower of Life is explained in more detail. 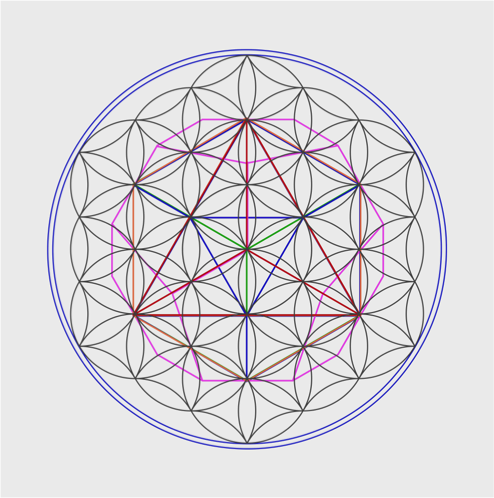 All platonic solids superimposed over each other, over the Flower of Life, creates what is known as Metatron’s Cube, shown at right. All five solids fit perfectly within a cube all sharing a common center point. This center point is a point of rotation and is known as the power spot, point of transformation, it is a still point beyond space in time with access to angelic realms not accessible beyond the center point of rotation. As explained in more detail in, Sacred Geometry: Patterns in Architecture, the cube has been used as the core element of design in many traditional mono theistic cultures. Early Judeo-Christian and Traditional Muslim structures utilized the cube in their basic design. The arc of the covenant is recorded to have been stored in a cubic room in Solomon’s Temple. The Kaaba is a cubic structure where Muhammad has said Ala resides. At the core of design of the Great Pyramid, is a cube. At the center of this cube is the center of Metatron’s cube, the point of transformation. This center point of the pyramid and center of Metatron’s cube, coincides with the Kings Chamber, the point of transformation. Metatron’s Cube, as well as the Platonic solids and the Flower of Life are all three dimensional filling the core of the pyramid. Amplifying the center point energy, is the slope of the sides. The slope is derived from a 3:4:5 triangle. One half the base is 3 units, the height is 4 units and the resulting sloping side is 5 units. The relationship of one half the base to the sloping side is 3:5 yielding Phi,ø, 1.618/.618. This number sequence is the Fibonacci. The Great Pyramid is a living structure resonating the ratio of Phi to the center point of the pyramid. The Pyramid has nothing to do with burial but rather transformation to higher states of consciousness by way of Sacred Geometry. The Great Pyramid is a living example of how we are to use Phi, The Golden Ratio to build today to expand our consciousness. 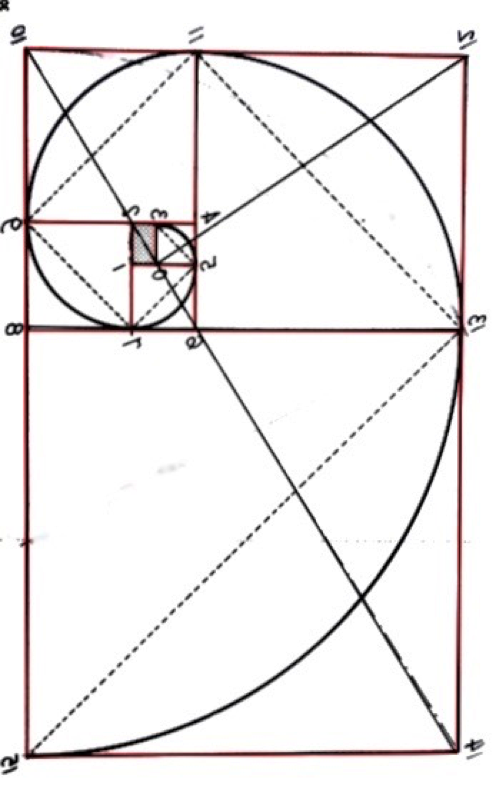 The use of Phi, the Golden Ratio, is-explained in Sacred Geometry: Patterns in Architecture. The planets of our universe move in patterns generating the radiance of Phi. One graphic of this pattern is the orbit of Venus around Earth creating what is known as ‘The Kiss of Venus. Venus’ orbit creates a 5 petal pattern every 8 earth years or every 13 Venetian years. This 5:8:13 pattern is significant because it is the Fibonacci sequence of numbers. This sequence is 0:1:2:3:5:8:13:21:34…., on to infinity. The same pattern, ratio, as the slope of the sides of the great Pyramid. The significance of this series of numbers, the Fibonacci, generates the relationship of 1.618/.618 or ø. Planets in our universe move in the Fibonacci pattern, Phi, resonating spirit. This pattern of numbers is significant. Add any two sequential numbers, and the result is the next in the series. Subtract them and you get the previous number in the series. Divide one into the other and you get 1.618. Reverse the division and you get .618. This is true for any two sequential numbers from 0 to infinity along this string of numbers. This number, ratio, Phi, is generated by the orbital patterns and arrangement of the planets of our universe. These same patterns exist in the presence and growth of nature. Our universe and nature on earth are connected by the patterns and radiance of Sacred Geometry. This is explained in Sacred Geometry: Patterns in Architecture. The floral patterns of the Plumeria and the Hibiscus both reflect the same pattern as the orbit of Venus around Earth, Kiss of Venus, the Fibonacci. 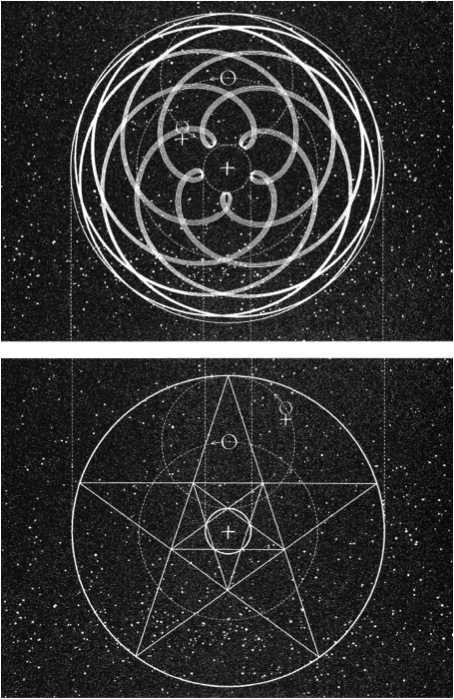 In the book, Sacred Geometry-Patterns in Architecture, other orbital patterns of planets and patterns in nature are described. All of these patterns of growth and movement are based in the Platonic solids of Sacred Geometry. 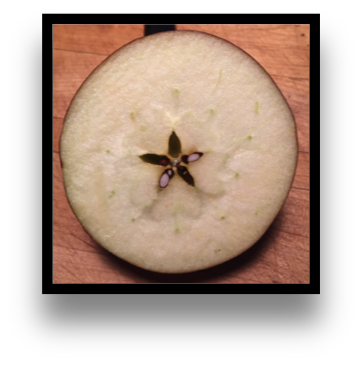 Another example of Phi in nature: cut an apple perpendicular to the core. What is exposed is the seed pattern of the apple. This pattern is exactly the same pattern as the Kiss of Venus. The orbit of Venus around Earth generating the Fibonacci series of numbers, Phi/ø. Venus is generating the energy of Phi around earth, constantly. Life is formed, grows in the pattern of the Fibonacci, the pattern of Phi, the same as star clusters are formed and move about in our universe creating Phi. The graphic form of Phi is known as the Golden Spiral. 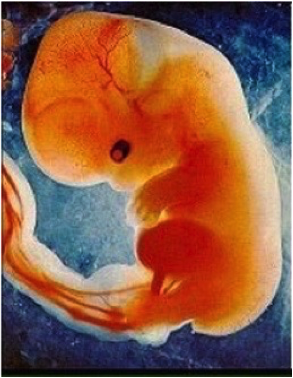 The fetus grows in the form of the Golden Spiral, allowing spirit to manifest in form. Star clusters form in the Golden Spiral, creating spirit. Phi does not create, life. Phi only opens the door for the God given gift of life, spirit, to enter matter to create life as we know. As electricity passes through a wire, a conduit, to create light in a room, Phi is the conduit of life for spirit to enter matter. The Golden Ratio, shown at left, is our design module for creating spirit into matter, our living environment. 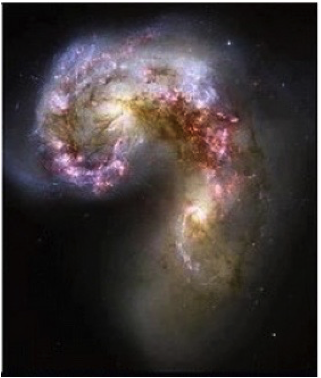 As the fetus and star clusters grow in the Golden Spiral, so should our design, to create spirit in our architecture. As Plato and Plotinus wrote (paraphrase): to get Godliness, spirit into our living space, all one needs to do is copy the sacred ratios and proportions of nature into our building structure. The Golden Ratio is that module. Designing with this module, the Golden Ratio, will certainly gain Godliness in our built environment, as it does in nature. The Golden Spiral, Golden Ratio, is called ‘Golden’ because by energy testing using Radisthesia, it emits a golden wave length of energy. This is the highest oscillating wave length of energy, spiritual energy. This is our building module. Applications of this module are shown in menu item: Patterns in Architecture. The Purpose of architecture is to act as our second skin, to nourish our spirit, as does nature.